A German attack recaptures most of Moreuil Wood, and the nearby Rifle Wood one mile to the northeast. General Seely is given command of the Allied counterattack. The Canadian Brigade attacks in three waves, securing their flanks while moving through the wood and engaging the enemy in hand to hand combat. Once the German forces are again driven out, they commence heavy artillery bombardment and several counterattacks, however control of the wood remains with the Allies at the end of the day. To the northeast, Rifle Wood is attacked at 09:00 and by 11:00 is also in Allied hands. By 15:00 the Allied forces are relieved by fresh divisions. At 02:40 the 2nd/21st London First Surrey Rifles Regiment begins an assault on the Turkish positions at Wadi Amman, Syria. They capture 2 machine guns and 80 prisoners. The troopship Celtic is torpedoed by UB-77 in the Irish Sea with the loss of six lives. Brigadier General Charles Lionel Kirwan Campbell CB CMG (commanding 5th Cavalry Brigade, 2nd Cavalry Division) dies on service at home at age 44. Charles Lionel Kirwan Campbell was commissioned in the Lancers on 13th February 1895. He saw active service on the North West Frontier (1897-8), including the Tirah expedition, and in the South African War (1900-1), where he spent a year as an ADC. From December 1901 to December 1906 he was attached to the New Zealand Defence Force. By the outbreak of the Gear War he was back serving with his regiment in the rank of major. 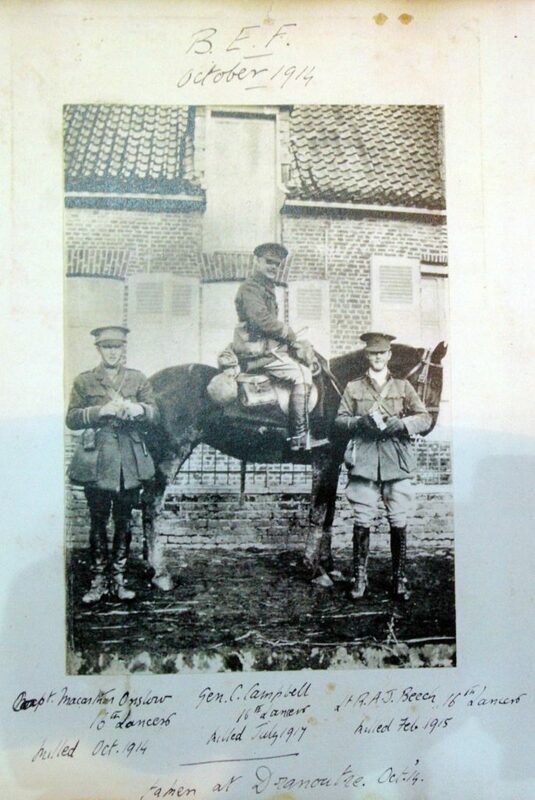 On 5th October 1915 he was promoted GOC 5th Cavalry Brigade, a post he retained until 21st March 1918, when Lieutenant-Colonel W F Collins temporarily replaced him. Brigadier-General Campbell died ten days later at home. Temporary Lieutenant Colonel ‘the Honorable’ Colonel Ralph Gerard Alexander Hamilton (Royal Horse Artillery commanding 106th Brigade, Royal Field Artillery) is killed in action at age 35. He is the Master of Belhaven and the only son of the 10th Baron Belhaven and Stendon. Lieutenant Colonel John Evelyn Carmichael Darley (commanding 4th Hussars) is killed at age 38. He is a veteran of the South African war and his brother was killed on HMS Good Hope in November 1914. He served as the Aide de Campe to General ‘Sir’ Archibald Hunter while Hunter was the Governor of Gibraltar. Major Claude Frederic Thomas Lindsay (Royal Field Artillery) is killed at age 26. A brother was killed in June 1917 and a second brother was killed five days ago. Major John Haworth Whitworth MC (Manchester Regiment) dies of wounds at age 38. He is the son-in-law of A J King former MP for Knutsford. Captain Charles Thomas Anderdon Pollock (East Yorkshire Regiment) is killed in action at age 28. He is the son of ‘Sir’ Ernest Pollock, KBE, KC, MP. Lieutenant George Gordon Francis Greville (Hussars) is killed at age 28. He is the nephew of the Earl of Warwick. Lieutenant George Gordon Francis Greville (Hussars) is killed at age 28. He is the son of the Honorable Louis Greville. Second Lieutenant Edmund Montague Prinsep Fisher (Royal Field Artillery) dies on service of peritonitis after suffering appendicitis at home at age 47. He is an architect and the son of historian Herbert William Fisher. His brother was killed on HMS Invinsible at Jutland while another brother was the Captain of HMS St Vincent at Jutland. Second Lieutenant Harry Battye (Warwickshire Regiment) is killed in action at age 22. His brother was killed six days earlier and their father died on service as a Color Sergeant in the Yorkshire Regiment at Kroonstad, South Africa in 1901. Chaplain Alexander Spencer MC (attached Inniskilling Fusiliers) dies of wounds as a prisoner of war. Private Thomas Platt (Cheshire Regiment) is killed in Salonika at age 26. His brother was killed on the first day of the battle of the Somme. Private Arthur Louis Pogson (London Scottish Regiment) is killed in action on the Western Front at age 19. His brother was killed in September 1917. Private Albert Charles Woore (Gloucestershire Regiment) is killed at age 22 nine days after this brother was killed. Gunner William Ewart Martin Lewis (Royal Horse Artillery) is killed at age 19. His brother was killed last August and they are sons of the Reverend William John Lewis Rector of Eydon.